H x W x D: 12.5 in. / 17 in. / 7 in. The artist, Attilio Prendoni, began his career at the Accademia di Brera in his native Milan where he was a pupil and assistant of the renowned Italian sculptor Ernesto Bazzaro (1859-1937). One of his most important commissions was for the monument to Francesco Cucchi in Bergamo's Piazza Cavour, inaugurated on May 30th, 1920, in honor of Cucchi's resistance to Papal power during the Italian Unification. Prendoni’s work was displayed alongside the most famous artists of his day. His marble figure of Artigli and a bronze entitled Il pittore Ludovico Cavalieri in abito del Settecento are in the Galleria d'Arte Moderna in Milan, and a large funerary monument to Mitzko Conforti is in the Jewish section of the city's Cimitero Monumentale di Milano. 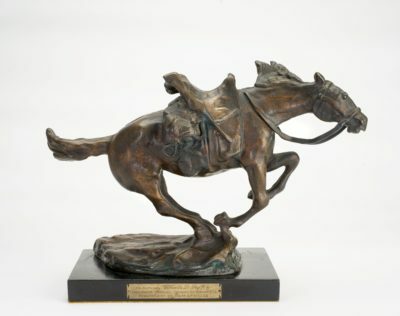 There are four other sculptures similar to this one in the collection of The Army and Navy Club (accession numbers 1966.01-1966.05), each one representing a different type of soldier in the Royal Italian Army from the 19th century. They were owned by Charles Griffin and gifted by him to the Club. Admiral Charles Griffin USN was a member of The Army and Navy Club in his retirement (retired 1968).